Moth flies are common, frequently-abundant insects also known as drain flies. 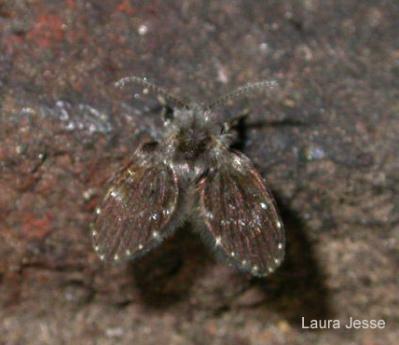 The name moth fly refers to this insect's superficial resemblance to a tiny moth. A fuzzy appearance is caused by a dense covering of long hairs on the body and wings. Drain fly is perhaps a more useful name for this insect because it describes one of the common sources of the flies in the home. These same flies are sometimes prevalent in sewage treatment plants where they are called filter flies or sewage flies. In homes, moth flies usually originate in sink, bathtub, shower, or floor drains, especially drains that are seldom-used or slow-running. The small fly larvae develop in and feed on the gelatinous film (slime) that can build up inside drains. They can also reproduce in other constantly-moist areas of decaying organic matter such as under dripping pipes and refrigeration equipment. Moth flies are of little importance except as an annoyance and nuisance. They do not bite or sting. Although they could possibly be vectors of disease pathogens because of their points of origin, there is no evidence of actual transmission. Control of moth flies requires locating and eliminating larval breeding sites. This may be very difficult to do; perseverance and imagination will be required. One way to check individual drains as possible breeding sites is to cover the drain with a plastic film taped to the floor or fixture (e.g., "Saran Wrap"® or a clear plastic bag). If the flies are breeding in that drain they will accumulate underneath the film within a day or two. The only effective method to eliminate drain flies developing in drains is to clean the inside of the drain pipe to eliminate the organic matter. Clean slow-moving drains with a stiff brush or other tool. Drains that cannot be scrubbed can be rinsed with water under high pressure or "sterilized" by slowly pouring boiling water down along the sides of the drain pipe. Another possibility is the use of a bacterial drain treatment that biodegrades the organic matter. Follow label directions carefully for best results. There is no benefit to treating drains with bleach or ammonia. Household insecticides can be used to control the adult flies, but this treatment will provide only very temporary benefit unless the source of the larvae is also removed.